Lewis Hamilton cast accusing glances at Ferrari and Kimi Raikkonen after his bid for a record-breaking British Grand Prix victory was ended in a first-lap tangle with the Finn, allowing his team-mate Sebastian Vettel to take victory and extend his championship lead. 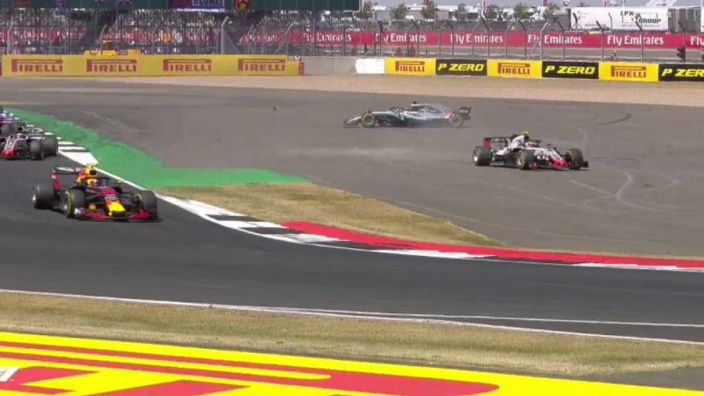 Hamilton made a poor getaway from pole, falling behind Vettel and team-mate Valtteri Bottas, but he was at the back of the field when Raikkonen clipped him at turn three, putting him in a spin. Raikkonen was given a 10-second penalty, but still finished third, behind Hamilton, who charged back through the field to take second behind Vettel. It means Vettel moves eight points clear in the world championship and Hamilton was happy to feed any conspiracies immediately afterwards. "This is the greatest race of the year and the greatest crowd, I am sorry I could not bring it home for you [home fans] today," he said on the podium. "My team did an amazing job this weekend, we got so much support. Interesting tactics I would say from their side [Ferrari], but we'll do what we can to fight them. "We'll take it on the chin, keep pushing hard, but believe me I will not give up." Raikkonen did not defend his actions post-race, having dived up the inside of Hamilton, only to bang the Mercedes' rear-right wheel. "He spun, it was my bad but that is how it goes sometimes," The Finn said. "It was not a straightforward race. It was my mistake so that was fine. That is how it goes. "Without the mistakes and the penalty it would have been better, but I tried."